Welcome to the Kingsport Grocery Company & the Gray Seal Upstairs! Hey friends! We wanted to reach out to all of you loyal KGC folks who have made our place your own. As a result of this year’s strong winter, which has understandably kept a lot of people at home, we’ve decided the smartest thing to do was to let KGC go into hibernation during the winter. The alternative was to run on a skeleton staff, but as you know, KGC is a 3-story restaurant, has 2 bar areas, and a large selection of drinks & food, all of which requires a lot of upkeep to do things right and risking the quality & service and hurting our reputation is something we are not willing to do. We’ll see you at KGC in the Spring and on Tuesday & Wednesday nights at The Bus Pit starting next week!! Thanks for being the pulse of what we do! ABOUT US - People love GREAT PIZZA, GREAT BURGERS & GREAT BEER. So we mix that formula with GREAT MUSIC & GREAT PEOPLE and the Kingsport Grocery Company is a great place to "Eat Well, Drink Well & Be Well". 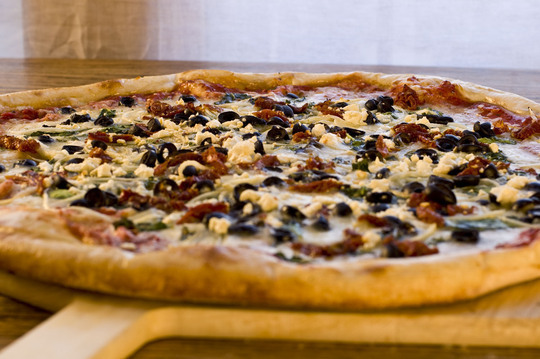 We feature the highest quality, hand-tossed (and largest) sourdough pizzas around, gourmet burgers, and of course the regions best craft-brewed beer selection (over 100) including high-gravities! KGC also has a full bar with wine and spirits! Hey friends! Thanks for coming to our website! The KGC will be taking a HIBERNATION for the winter! Please stay posted as we will anounce our re-opening in the spring! Kingsport Grocery Company is hiring.